I use this blog and my twitter account to complain when my Alienware computer fails, and I feel Dell isn’t listening. So I must use it to tell you that Rafael of Alienware Tech Support positively ROCKS!!!!!! I was VERY bitter Tuesday evening when my “repaired” M17x came back and promptly failed in SL again. Armed with a glass of wine and a few unscheduled evening hours, I called Alienware support on Wednesday evening. Rafael took my call. Yes, I DO know his last name and I’d be thrilled to tell all of you and even more thrilled to tell his management. But I did not get his permission to publish his name, so this will have to do. Rafael – you are THE BEST!!! He was upbeat, positive, and determined to fix my machine. We were on the phone for at least 90 minutes, probably more. In that time he ran a test or two, but mostly he LISTENED to me and he READ the account log. What a concept. Listening to the client. We talked about the problem, we both agreed it was the driver. I had 2 new graphics cards but the same old drivers. The error message had been saying “driver” all along. Rafael researched, searched and downloaded the latest drivers for my cards. It was my very good luck that nVidia had just published new drivers the week before. Getting that driver installed, however, proved to be a bit trickier. Suffice it to say that Rafael stayed the course, double-checking with his peers, and working diligently to get the drivers updated. He came inworld with me to watch me push the SL settings to the max and begin throwing continually changing video information at the machine. We encountered my good friend Greg at the Fogbound. Greg chatted with me and Rafael. I felt VERY good about that because not only was Greg knowledgeable and articulate, but he was backing up everything I’d said to Rafael earlier and all of Rafael’s own conclusions. 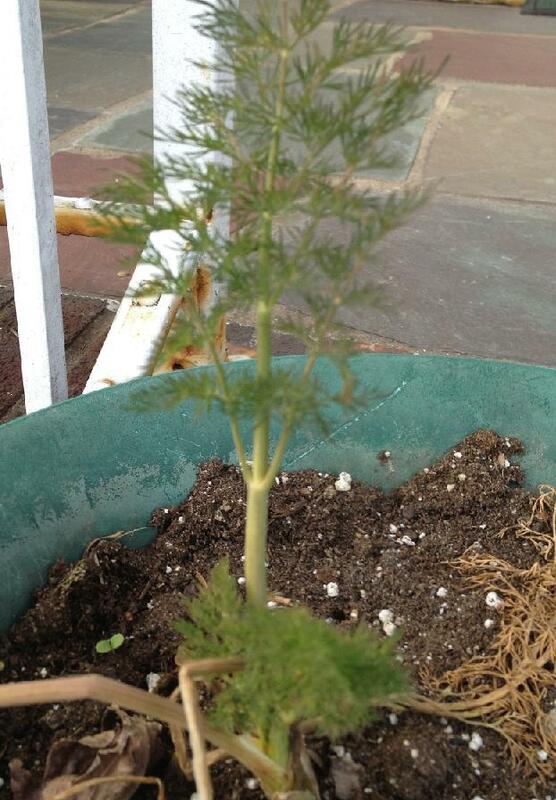 So – Rafael is a STAR!!!! My beloved Alienware M17x is in working condition yet again. I have my full pixel count – 1920×1200. Things are rezzing quickly and beautifully. I have shadows, reflections and depth. Yay Rafael! Yay Alienware Tech Support! Okay – I’ll even give a shout-out to Dell – that’s how happy I am to have my Alienware M17x back and running. *HUGS* to all! Dell, Secondlife and I have a problem. I’m sure that the 2 of them don’t care, but I do. So my gorgeous gaming laptop, the famed and fabled Alienware M17x came back today – “repaired”, or so Dell claims. I headed into SL, turned the graphics up to high, and set out. Only took about 10 minutes before the video failed. The screen goes black, then it turns white, then I get a box (that fades fairly quickly) telling me that the drivers failed, but they have “successfully recovered”. Really? I don’t think so. Why is it Dell’s problem? Because from now on I intend to tell everyone all over how Dell is incapable of offering proper support for configuring their gaming computers. And because I believe that they are not telling me truth about this repair. I have PAID for in-home support. That means they are supposed to come to my home and replace parts while I am watching. They refused to do this and demanded that I send the laptop to them for “analysis”. I did. I shipped it out Thursday afternoon and saw that they received it Friday. It was back in my house on Tuesday. That means they shipped it Monday. Really? You performed analysis over the weekend? Why do I find that hard to believe? The piece of paper claims they replaced/repaired my video card. I find that incredibly difficult to believe. It’s hard to believe because they didn’t have it long enough. Because when I turn on the computer and head into SL, the fans immediately make more noise than a helicopter coming in for a landing. Because it only took 10 minutes to crash out the M17x. Why do I think this is Dell’s problem, not SL’s? I bought a new laptop 3 weeks ago. Nothing fancy – an Ideapad Y580. Guess what. It runs SL at Ultra graphics, quietly, smoothly and without crashing. That’s right, Dell. A mere Ideapad laptop whips your famed fabled premiere gaming laptop. Yeah, when I have the time and energy I’ll call Dell’s Customer Service. I’ll undoubtedly have to beg and fight my way to talk to someone who actually knows something about their Alienware brand. That’s another big runaround that I get from their Customer Support. The techs say “oh yes, I know that”. Only after something happens, like last year, when the machine caught fire, do I find out that I’m dealing with people who have no special knowledge of Alienware. I’m so disgusted with Dell. I have been a loyal customer for over 6 years. All of our computers were Dells or the Alienware until I bought the Ideapad. I have a year left on my contract with them. I’ll send them the AW every single week for the next year until they make it work properly for my needs. Don’t tell me it’s SL. You should be so ashamed, Dell. Expect to hear from me. Every single week, if not every day. It’s going to be one heck of a year. In the meantime…. having some fun while I still can….. I’m an Engineer!!! That’s me with my very own Spirit of Arcadia, found in the Steam the Hunt 8. This engine is scripted to run on SLRR – the Second Life Railroad. Just rez it up and go for a ride! It includes a note card that lists RR rezzing stations as well as instructions for handling. Many thanks to Troy Waxen, co -curator of the Arcadia Asylum Living Library in Makazi for providing this wonderful prize! I need to find the proper attire for my new career…..
*laughing* According to Fedex, my laptop has been received at the local facility. And this song sprang to mind…. Oh bring back my laptop to me! I may give up on computers and electronics all together. Supposedly my Alienware is on its way back to me. Not that @DellCares told me this. Not that Dell called the correct phone number to tell me this. Dell called and left the message on my home phone DESPITE my having called the day before to explicitly ask to have all communication come to my cell phone. Just one more example in this total farce of how one hand of Dell has no clue what the other is doing. There was a very cool presentation scheduled for SL on Friday Feb 24th. I have it on my calendar. I arranged to work from home that day so I can make it inworld. The original email was sent Jan 25, 2012 and listed 4 events for their Thursday “Train for Success” speaking series and listed the dates. I copied the dates into my calendar, focusing on the DATES not the other text. Then on Feb 22 I got a reminder email. I saw it was the same 2 events, ignored the email. Unfortunately this was in the email: this Thursday, February 23, noon ET (please note that we had the date wrong in our previous email). No highlighting, no alert in the subject, nothing to catch my eye and make me realize that I had the wrong date. Yep, I missed it. Got home today, booted up my work machine, opened my browsers. I use Firefox with great reluctance. I keep most of my tabs open in Chrome. My coworkers think I’m nuts – they all love Firefox. I think it stinks. I think it runs terribly on my machine, I think it crashes. I’m willing to concede that all of that could be me, my machine, my settings. I used to use it exclusively until it kept crashing on me when I had music playing. But I keep 4 basic tabs open: my avatar’s email account, my RL persona twitter account, Google reader, and a work-related tab. Tonight – Twitter no longer works on Firefox for me. Yes – this is strictly Firefox related. Twitter opens just fine in Chrome and IE for me. My Dell Inspiron, which has been trying valiantly to support my SL habit, is now freezing every 60 seconds or so. I tried to talk to Honour, but it’s very hard when the machine freezes and you can’t type or move. I logged out. I’m tired of being warned left and right that as of March 1st, Google owns my data. I’m not tired of the WARNINGS, you understand, I’m tired of what they imply. I’m frustrated by the concept that we and our personal data are simply up for sale. That we cannot derive benefit and joy from all the cool technological advances without the fear of all the not-so-nice folks harming us via those same technological advances. I want my gaming computer back and working. I want people to proof-read their emails, or at least send corrections that stand out. I want things to work. If I have a question, I want to be able to contact support and get an answer without getting a run-around. I know I’m tired. I know that this is frustration writing. But it’s been 3 weeks with NO gaming computer, and weeks before that of an ailing gaming computer. So….. I got it out of my system. I’ll finish on a positive note. Where I live, winter has basically passed us by this year. After last year – that’s okay with me. Normally I love the change of seasons. But last winter was harsh enough to count for at least two, if not three, winters. 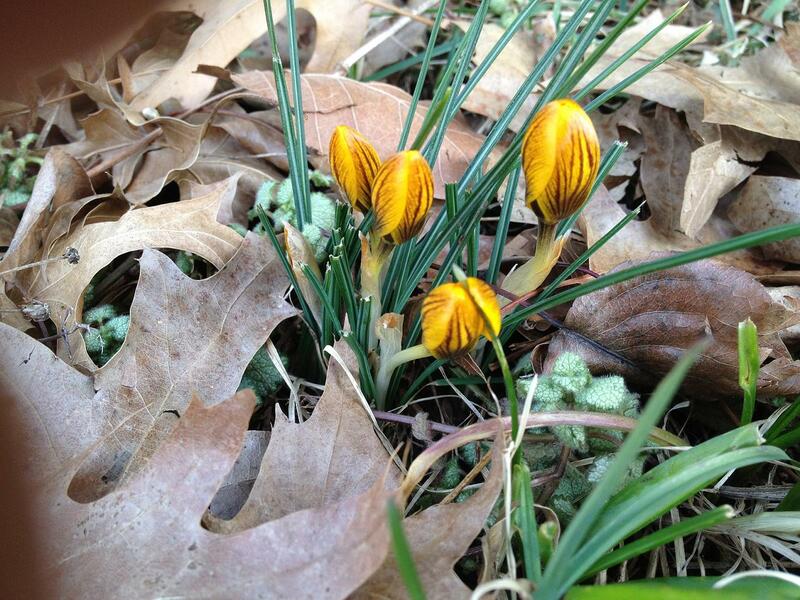 On Feb 19 my crocuses were up. 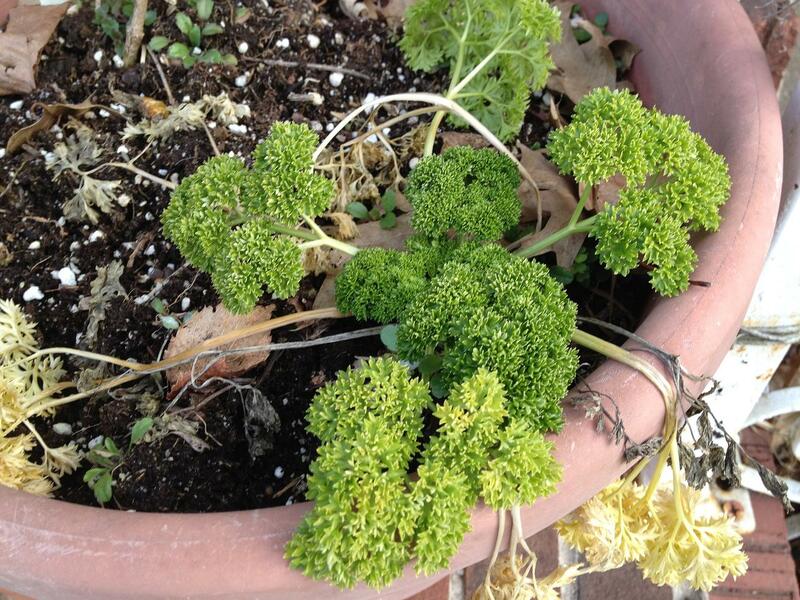 My parsley stayed blooming through the winter, as did the dill. The bay leaves almost made it. 🙂 You see the photos here. I will look at my plants. I will pick up my hard-back book that I got at the library on Sunday and I will curl up in a chair, with a cat or two on my lap, and read. Like the Terminator, like MacArthur, I’ll be back. I gave you my little “prayer” in my last post. It’s Epic Poem time. My apologies to Don McLean. I’ve gotten this far, I’m asking for help with verses! Sure, we can stretch it a bit – it doesn’t have to be limited to just MY heartbreak…. Along with a loud Snap! Pop! The day my laptop died…. Why, why did my laptop just die? The video card, it just fried. If the help desk tells you so? Now do you believe in Alienware? Game for hours without a care? Can you teach me how to mouse like a pro?